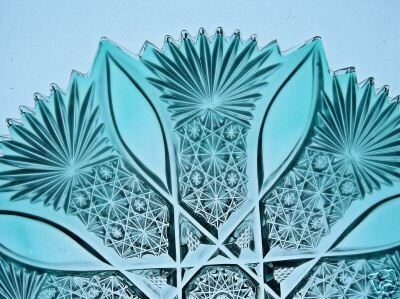 Several examples of the use of colored glass in connection with the techniques of cutting and engraving are given in this file. They usually cannot be discussed in detail because of the paucity of primary documentation — extant American factory records seldom mention colored glass. This is also often true for foreign glasshouses, although a beginning has been made to remedy this situation with the appearance of CRISTALLERIES DU VAL SAINT-LAMBERT, a composite catalog published by the American Cut Glass Association in co-operation with the Rakow Library of the Corning Museum of Glass in 1998 (234 pp). St-Lambert (Belgium) colored glass is often represented as being American-made — frequently by C. Dorflinger & Sons — at antiques shows, auctions, and on the Internet. (1) “Cased glass” and “overlaid glass” are terms that are used synonymously. While this is true today, it was not necessarily true in the past. Some earlier writers associated cased glass only with a colored layer of glass that was produced by the so-called cup method. Others assumed that overlay indicates that the item was “dipped” in a batch of colored glass. David Whitehouse, the executive director of the Corning Museum of Glass, has used both cased glass and overlaid glass in the same sentence in his description of an item from the nineteenth century: “. . . A large cut and gilded vase of colorless glass cased with three colored overlays” (Whitehouse 2000, p. 41). 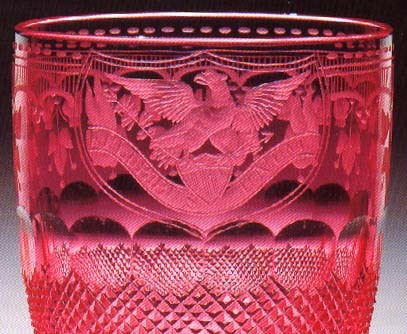 Whitehouse is referring to an exhibition vase that was prepared by the New England Glass Company about 1850. It is now owned by the Corning Museum of Glass (acc. no. 93.4.9) and has been discussed in detail by Spillman (Spillman, J. S., 1996: American glass in the Bohemian style, The Magazine Antiques, Jan 1996, pp. 146-55). A third term, “plated,” was used for this type of glassware during much of the nineteenth century; today the term is archaic. (2) “Layer” is a thickness of glass “spread over a surface” according to dictionaries. But here it is also the surface itself! That is, any glass object can be considered to be a layer. This sounds strange, but it arises from the fact that, in the so-called cup method of casing, for example, all of the layers of glass involved — including the object itself — have begun life as individual gathers of molten glass. Thus, a colorless or colored (solid) wine glass is described as a glass of one layer, and the vase referred to by Whitehouse in (1) has four layers. (3) “Colorless.” How this term is used is even stranger than that of layer. In layering, colorless glass is regarded as if it were colored glass! Therefore, our colorless or colored (solid) wine glass is a glass of one color as well as a glass of one layer, while the familiar cut-to-clear item in cut glass has two colors (and two layers). The vase described by Whitehouse in(1) actually has four colors and four layers (of which three are external overlays). (4) “Color.” Colors are not standardized, and their descriptions are, to a degree, subjective. Therefore, each part of the spectrum — red, orange, yellow, green, blue, indigo, and violet — contains a wide gradation of hue. For example, blue can range from aqua to turquoise to a deep blue. Different observers will, subjectively, often describe a particular color differently: thus, one man’s yellow can be another man’s amber. We can now discuss layered glasses, as well as other glasses of color, that are found in the nine basic categories listed above. Both the number of layers and the number of colors range from one to four. Items that were part of the Corning Museum of Glass’s exhibit “Splitting the Rainbow” during the summer of 2006 are included, but the reader can find a more extensive description of that exhibit in other reference materials. 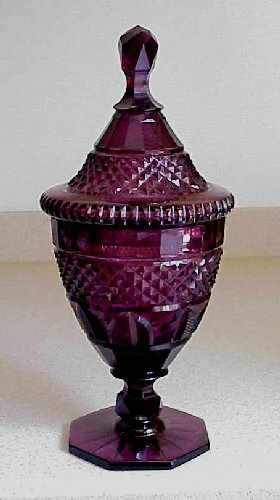 Although cut glass on blanks made of a single (solid) color is typical of the American middle period (c1830-c1876), solid color was also used, although to a lesser extent, during the Brilliant Period that followed. The bowl on the wine glass below has a color that is closer to gold than to yellow; unfortunately this is a color that does not reproduce accurately. The glass is possibly American in origin, but it also could be either English, Belgian, or French. It is often difficult to distinguish between glass made of a single, solid color and colorless glass that has an interior overlay of color. 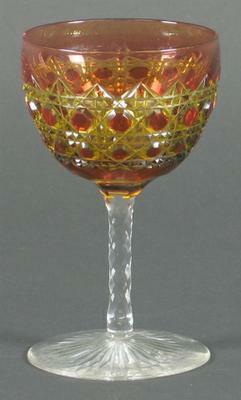 Compare the “gold” wine glass to the example shown in category no. 3, below. Notice that in the case of a solid color, the thicker parts of an object have color of a deeper tone. In no. 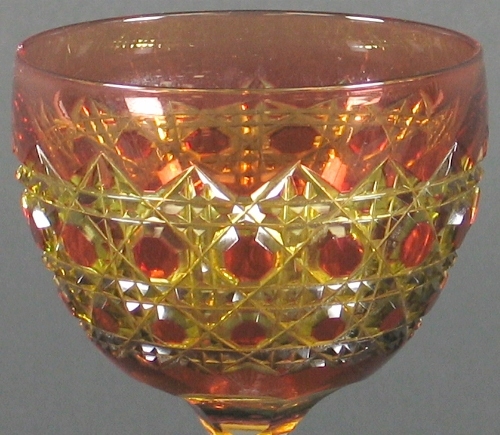 3 — colorless glass with a colored interior overlay — the color’s intensity is uniform throughout the bowl of the wine glass. The Hawkes vase on the right, below, is described as “solid blue” in the company’s catalog (Sinclaire and Spillman 1997, p. 104). LEFT: Wine glass with a pattern of alternate open and quartered diamonds, bordered with a row of small punties. The faceted knop contains an air trap that extends down the length of the fluted stem. 32-pt star foot. Lead glass. Late nineteenth or early twentieth century, possibly English. H = 5.1″ (12.9 cm). From a set of six glasses, sold individually, priced from $150 to $250 in 1991. 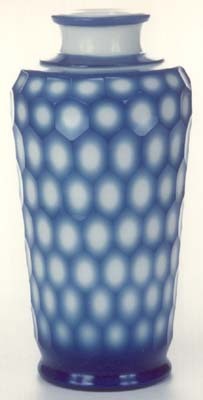 RIGHT: A vase in solid blue glass cut by T. G. Hawkes & Company (but not signed) during the 1920s to the early thirties. 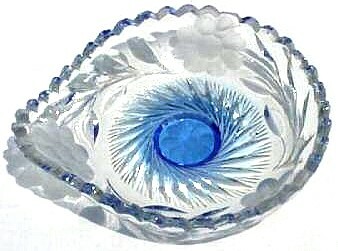 The “eye-lid” motif was made by slice cutting, originally an early technique that was revived by Hawkes and used (with additional motifs) in a series of designs the company called Old English or Waterford, but they were not always so designated. H = 8.6″ (21.8 cm). A 10″H version of this vase is shown in a c1925-35 Hawkes catalog where it is priced at $40 (Sinclaire and Spillman 1997, p. 104). (Image: Internet). BELOW: The following example, although not signed, is obviously from the same Hawkes series as the blue vase. It is in solid amethyst, is 12″ (30.5 cm) high, and has a maximum diameter of 5.5″ (4.0 cm). Although this covered urn was offered at an eBay auction in 2006, the highest bid, $34, failed to reach the seller’s reserve (Image: Internet). Three inkwells, cut, in solid colors. Manufacturer(s) and dates are unknown. These three examples of American (left), probably English (right), and French (below) colored glass cut-to-clear show similarities and differences in national cutting styles. The American style is typical of the Brilliant Period during the early years of the twentieth century. The presumably English bowl is probably also from the early twentieth century, while the French example can be dated 1905, a time when the “American style” of cutting was popular on the Continent. LEFT: D = 9″ (22.9 cm), H = 4.25″ (10.8 cm) Private collection. RIGHT: D = 9″ (22.9 cm), H = 4″ (10.2 cm), wt = 4 lb (1.8 kg). Lead glass. Sold for $160 in 1995. Remarkably, the American bowl is an exact duplicate (shape, size, and cutting) of an item shown in the catalog that accompanied an exhibition of American colored cut and engraved glass held by the Museum of American Glass in 1991 (Taylor 1991, item no. 28). 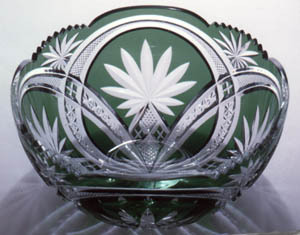 The exhibition’s bowl is said to have been cut by Walter Gross (1883-1956) who worked at the Quaker City Cut Glass Company, Philadelphia, PA between 1904 and 1909 (Mucha, M. E., 1986: Quaker City — Hand Finish, The Glass Club Bulletin, No. 149, pp. 9-11). 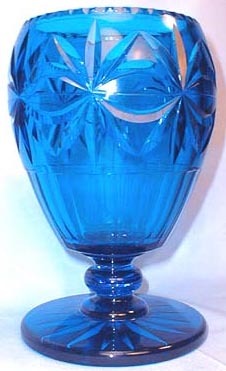 It is unusual to find, independently, two cut-glass items that are identical; this is especially true in this case, because colored cut glass itself is scarce. This coincidence is reported here for the first time. The bowl was discovered in New England several years ago. Its pattern is unknown but could reasonably be given the name “Walter Gross” until its catalog name is discovered. 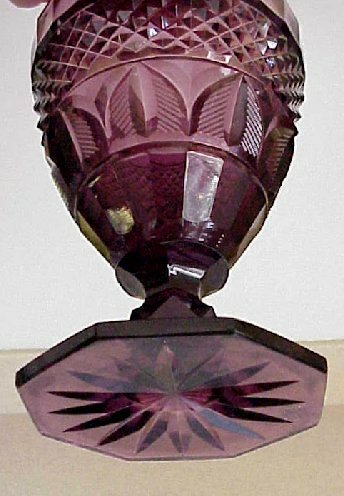 The pinwheel motif is cut in a distinctive manner, with triangular vanes, that is similar to both the earliest known patented pinwheel — by P. H. Healy for the American Cut Glass Co. in 1899 — and one cut by the H. C. Fry Glass Co. during the early years of the twentieth century. The Quaker City pinwheel shown here appears elsewhere, notably in the “Tornado” pattern sold by the NYC discount company Higgins & Seiter, but its manufacturer is unknown. To distinguish between pinwheels that have triangular vanes and the standard pinwheel, the name tornado pinwheel is suggested. BELOW: Section of a “novelty decanter” made by Baccarat, France, 1905. Amethyst cut-to-clear. An example cased in pink, but otherwise identical, is shown in Curtis (1992). Note use of an “American” 8-pt hobstar. The pattern is not named (Image: Internet). 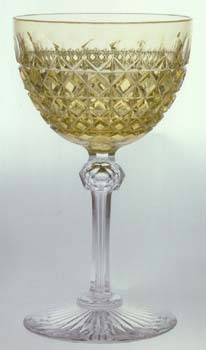 The following is the bowl of a wine glass that was cut and engraved by T. G. Hawkes & Co. for the White House in 1885 or 1900 (Spillman 1996, p. 238; photograph (detail) by Nicholas Williams). 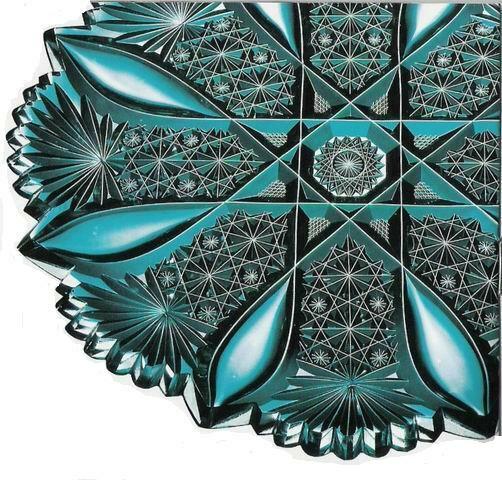 The cut pattern is identical to that found on colorless stemware attributed to the Dorflinger Glass Company as early as the 1860s. The engraving here features the arms of the United States. Cut and/or engraved items with interior overlays, such as this glass, are often erroneously identified as being made of glass of a solid color.
. . . . . o o O o o . . . . . The technique used to produce this plate which the Museum acquired in 2003 was also used to make a smaller, matching plate that appeared on eBay during the autumn of 2006. Its image is also reproduced in this section. Differences in the appearance of the two plates are due to the different photographic and printing processes used, as well as the fact that the eBay plate has been photographed against a blue background. Both plates differ considerably from the photo-image of the Museum’s plate as published by Spillman in a general article that introduced the Splitting the Rainbow exhibit (Spillman 2006, p. 5). American Glass. 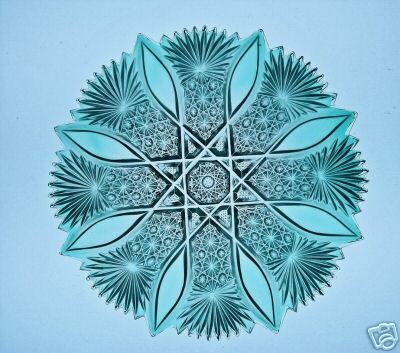 This turquoise color was made by Corning Glass Works. It was used by cutting shops in Corning and also by C. Dorflinger & Sons in White Mills, Pennsylvania. Corning may have been the only American producer of this color. Plate. “Grecian” Pattern. U. S. Corning, New York, T. G. Hawkes and Company, about 1887-1900. 2003.4.26, purchased with funds from the Estelle Sinclaire Bequest. The color of this plate varies from Corning’s standard production, so the blank from which this piece was made may have been created by a glasshouse elsewhere. Incidentally, this case also contained three other “turquoise” items. Two are cut-to-clear: a vase in the Venetian pattern (acc. no. 97.4.22) and a vase cut “about 1900-1915” in an unknown pattern by Lyman Day, a cutter known to have been associated with the Hunt Glass Company (acc. no. 92.4.155) . The former vase has been described elsewhere as having a “greenish blue overlay” (Whitehouse 2000, p. 41). A very similar Venetian vase is shown in Cassel 1882, p. 5 and Boonstra 1995, p. 18 where the casing is described as “aqua.” The writer would describe the overlay on the Day vase as dark blue rather than turquoise. It is shown, in color, on the dust jacket of the book THE COMPLETE CUT AND ENGRAVED GLASS OF CORNING (1977 and 1997 editions). The case also contained a “rock crystal” wine glass whose bowl is a solid light blue (aqua). This glass was engraved by H. P. Sinclaire & Company about 1912, and its blank “may have been made in England” according to its label (acc. no. 93.4.72C). Following is the image of the Museum’s plate that was used in Spillman’s article. It is a section of an enlarged view of the entire plate, a small photo of which is shown, in color, in the Museum’s ANNUAL REPORT, 2003 (p. 2). There it is described as an “aqua plate” (p. 12) as if it were made of solid color which, of course, it is not. There is no mention of layers in its description in this report nor in Spillman’s article. Remarkably, this image of the plate shows three characteristics that do not appear on the plate as exhibited. As a result, the plate looks considerably different “live” than it does in this photograph which is greatly misleading. (i) The over-all appearance: At first glance the image of the Museum’s plate suggests that the plate is cased externally and has been “cut-to-clear,” to use the phrase often applied to such two-color items, including those that are discussed in section 2, above. We know that this is impossible, however, because the overlay or casing is on the interior, that is the uncut, side of the plate which faces the camera. Under normal viewing conditions, such as those in the West Bridge gallery where the plate was located during the exhibit, the plate did not show the clear (colorless) miter cuts and colorless areas that are present in the image, only an overall bluish green that colors the entire plate, excepting only the plate’s rim where one can clearly see the plate’s thick, colorless outside layer, the layer that has been cut. 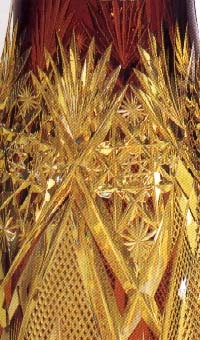 It is emphasized that the clear areas in the image — the miter cuts, the areas at the “top” of the “pea pods” and around the central Brunswick star, and especially the colorless miter cuts by which in the image so effectively shows the Russian motif that is part of the pattern — they all disappear in reality. What has happened? The photographic setup required to produce the published image obviously included a strong light to illuminate the plate’s cut side, together with a camera that was placed on the opposite side of the plate, viewing its uncut, cased surface. It is assumed that all three objects: light source, plate, and camera were aligned roughly in a straight line so that light fell perpendicularly onto the cut surface. As a result, any part of the cut surface that was perpendicular to the rays from the light source, which are roughly parallel, had its color “drained away” by the intensity of the light source. This explains why all of the colorless areas and lines, including the latter which were cut by the V-shaped miter wheel, appear on the image but are invisible in a “live” viewing of the plate. Because the sides of all of the V-cuts do not present surfaces that are perpendicular to the light source, they show color. The foregoing is an intuitive argument. It needs to be backed up with an explanation from a physicist, a “proof” that is complete with diagrams of the rays of reflection, refraction, and transmission, and perhaps even with an equation or two! (ii) The overlay: The owner of the eBay plate has commented that his overlay “has a frosted appearance rather than clear [i. e., is transparent]” and this characteristic is shared by the Museum’s plate even though it is not seen in the photo-image. The “frosted appearance” might be better described as translucent glass in contrast to the transparent glass of the colorless layer. Most overlays are transparent rather than translucent, excepting those that are opaque, of course. The writer believes that this translucency was an experiment. The overlay is not defective. There is no crazing, for example. Placed in proximity to the other items in the “turquoise” case, this “frosted look” stands out in sharp contrast to the glitter of its companions..
(iii) The color: As mentioned previously the color of “turquoise”as found in cased glass varies widely, from a bluish green to a greenish blue with many shades in between. Both the owner of the eBay plate and the writer independently initially regarded the overlay to be a bluish green while the Museum itself has described the color variously as green, as aqua, and as turquoise during the past few years. In any case the blue in the photo-image is, in actuality, seen as green (or bluish green, if you like) on the plate displayed in the Museum. It should be clear by now that the photograph that represents the Museum’s plate should be replaced, or at least supplemented, with one that truly represents this most unusual example of cased cut glass. BELOW: The 7″D plate that was auctioned on eBay during the fall of 2006. The bidding stopped at $698, a figure that was below the seller’s minimum; therefore, the plate failed to sell (Images: Internet). Acknowledgement. Many thanks to members of Antique Glassworks who have discussed the Museum’s plate with the writer and to the seller of the eBay plate who has shared information and imagery. The Fry Glass Company experimented with this technique early in the twentieth century. 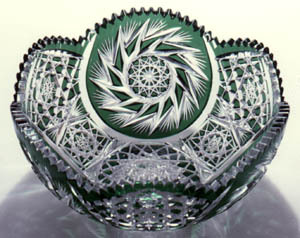 Apparently the result was not particular popular with the public as few pieces of “shaded” colored cut glass was produced. This example, a dish whose length is probably 7″ or 8″ long, sold for $128 at an eBay auction in 2005. Note rim chip. One would think that colored glass cut to colored glass would be fairly common. And while this seems to be true for stemware, examples that were unquestionably made in the United States are not often found. The following image is typical of what one finds today, and its origin is uncertain. Usually generic patterns, such as this cane pattern, are among those that are found on this tableware, but proprietary patterns such as Venetian by Straus can also be found. The Straus examples probably were cut on Baccarat blanks, but whether in France or in this country is not known. In the following images red glass is seen to be the exterior casing, but is the interior yellow glass a casing or is it the solid color of the glass’s bowl? It could be either. In these images one can clearly see the thickness of the red layer. But the yellow layer might be deceptive because one may be looking through a perfectly transparent colorless layer to the yellow color of an interior casing. With color-on-color one is always faced with the question as to whether or not there is a layer of colorless glass between the two colors. In small items such as the wine glass, it is usually assumed that the only layers are the two colors, and this is assumed here. But each example must be examined individually and this glass has not been so examined. Unfortunately, for items of this size this requires laboratory equipment. When larger, more thickly blown items are considered, however, any colorless layer present is more readily seen, as described in the following section. In this situation a kind of Oreo cream sandwich has been created: a layer of colorless glass has been encased between internal and external overlays which may be of the same color (A) or of different colors (B). (A) Internal and external casings of the same color. Items in this group photograph poorly because they appear to be made of a solid color although there are actually three distinct layers present. A good example is shown and discussed in Lone Star Chapter (1994, p. 397): “The interior and exterior of this basket is cranberry with clear glass between the layers of cranberry,” a description provided by the basket’s owners, J. and C. Parks. (B) Internal and external casing of different colors. A claret jug that is found in Spillman (1996, p. 54) is provided with a description that is incomplete: “Cased cranberry over colorless glass.” Fortunately, this item is in the Corning Museum of Glass’s permanent collection, and, therefore, it can readily be analyzed. (The jug was, in addition, part of the Museum’s “Splitting the Rainbow Exhibit” in 2006.) When viewed closely it is evident that this item has three layers. In addition to the interior casing of red glass, indicated by Spillman, there is an external layer of amber glass which is cut to the colorless layer which actually forms the core of the jug, similar to the case of the cranberry basket described above. 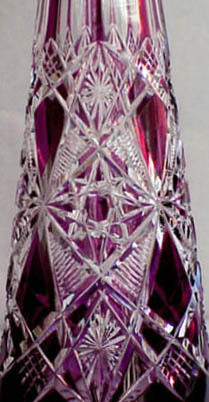 A second claret jug is also shown by Spillman (1996, p. 55) and is described by her as “cased cranberry over amber” which indicates that the item has only two layers. It is more likely, however, but cannot be proved at this point, that this jug is also made up of three layers: an external casing of red (cranberry) cut to colorless glass that has an internal casing of yellow (amber) glass. The jug is in a private collection and could not be examined for this file. (It was not shown at the “Splitting the Rainbow” exhibit.) Nevertheless, the colors match those on a set of dishes once owned by the writer that had three layers and three colors. While this does not indicate that the jug is similarly constructed, it does suggest that it might be. Therefore, this item is being retained in this group until it becomes possible for it to be examined. 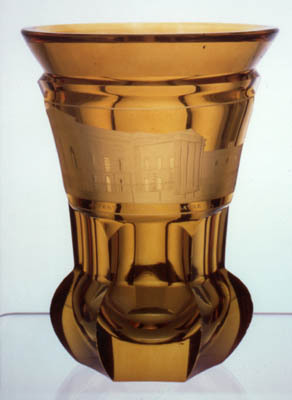 At this point it is worthwhile to comment on the famous Borrelli loving cup, cut in Hoare’s Crystal City pattern (Boonstra, 1995 (p. 12), which was exhibited (on loan) at the “Splitting the Rainbow” exhibit where it was inadequately described as follows: “The loving cup, red over blue, is unique,” a statement that incorrectly indicates that there are two layers and two colors. Actually the item has a colorless body with an interior casing of red glass and an exterior casing of blue glass that has been cut-to-clear, which is a far cry from “red over blue.” But one might feel that the exhibit has made some progress from the situation in 1994 when the loving cup was described by the experts at the American Cut Glass Association as having a “full colored glass body” with no mention of layers, let alone colors! (The writer has seen an example of opaque white glass cut to colorless glass, probably mid-nineteenth century and American, but it is not now available. The cut pattern consisted of gothic arches and trefoils.) The example shown here — opaque white cut to transparent red — is English, made at a time when the English factories were in competition with Bohemian glassmakers who excelled at producing fine colored glass. Section of a decanter manufactured by George Bacchus & Sons, Birmingham, England, c1850. 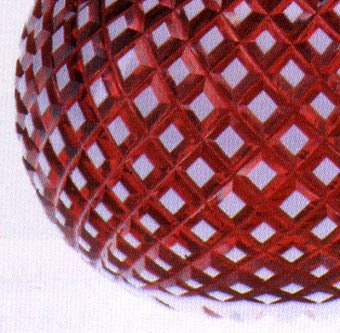 Opaque white glass cased onto a body of solid red, transparent glass (Hajdamach 1991, p. 87). Vase. H = 10.5″ (26.7 cm), max D = 5.5″ (14.0 cm), wt = 2.0 lb (0.9 kg). Base ground flat and polished. Non-lead glass. Sold for $150 in 1993. One of a pair of stained-glass beakers with engraved-to-clear cartouche. Cut, then subsequently painted with an amber stain which was “fired” for permanence. The marks of application are faintly visible when the item is viewed in front of a strong light. Details of the copper-wheel engravings (“London Bridge” and “Covent Garden Theatre” — which is shown here) are displayed elsewhere. Probably made in Bohemia and imported for the British tourist trade, c1850, but note that there is a ground and polished pontil and the beaker’s rim has not been ground — characteristics that are usually thought of as English. H = 5.5″ (14.0 cm), rim D = 4″ (10.2 cm), wt = 1.25 lb (0.6 kg). Sold for $100 (each beaker) in 1990. [Boonstra, Nick, ed. ], 1995: American cut glass in color, The Hobstar, Special edition no. 1, Feb 1995, 20 pp. [Cassel, Chet, ed. ], 1982: [Colored cut glass issue], The Hobstar, Vol. 4, No. 9, 8 pp. Lone Star Chapter, 1994: COOKING WITH CLASS, DINING ON GLASS. American Cut Glass Association, Carrollton, TX, 414 pp. Taylor, G. L., 1991: COLORFUL CUTTING. Museum of American Glass, Wheaton Village, NJ Exhibition catalog, 6 Apr-27 Oct 1991, [6 pp. ].